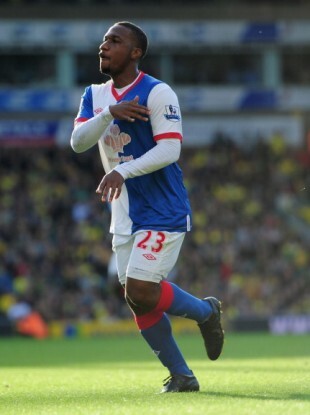 Junior Hoilett of Blackburn Rovers. BLACKBURN WILL AIM to build on their win over Wolves when they welcome Sunderland to Ewood Park tonight. Steve Kean’s men have continued to improve after their struggles early in the campaign, moving three points clear of the Premier League drop zone with the 2-0 win over Wolves. Sunderland were impressive when Martin O’Neill took over in December last year, but stumbled in recent outings. They have won just one of their last four matches in all competitions, a run started by a 4-0 loss at West Bromwich Albion on February 25. With Sunderland missing Stephane Sessegnon and Lee Cattermole through suspension, this shapes as an excellent chance for Blackburn. Kean has praised the form of Junior Hoilett, who netted a brace in the win at Wolves, while the manager has also assured Ruben Rochina and Simon Vukcevic they have a future at Blackburn. “They (Rochina and Vukcevic) are in competition with other lads who are playing very well at the moment. I think (Mauro) Formica has played very well wide, Marcus Olsson has come in and had an impact,” Kean told the Lancashire Telegraph. Yakubu (13 league goals) has been the star for Blackburn this campaign, but he’s failed to score in his last three matches and has netted just once in his last seven. Sunderland, who drew 1-1 with Everton in their FA Cup quarter-final on Saturday, are still without Kieran Richardson, and O’Neill will miss the influential Sessegnon (six league goals and seven assists). Taking on a weakened Sunderland team, Blackburn have the perfect opportunity to move further clear of the bottom three. Email “Premier League preview: Blackburn v Sunderland”. Feedback on “Premier League preview: Blackburn v Sunderland”.